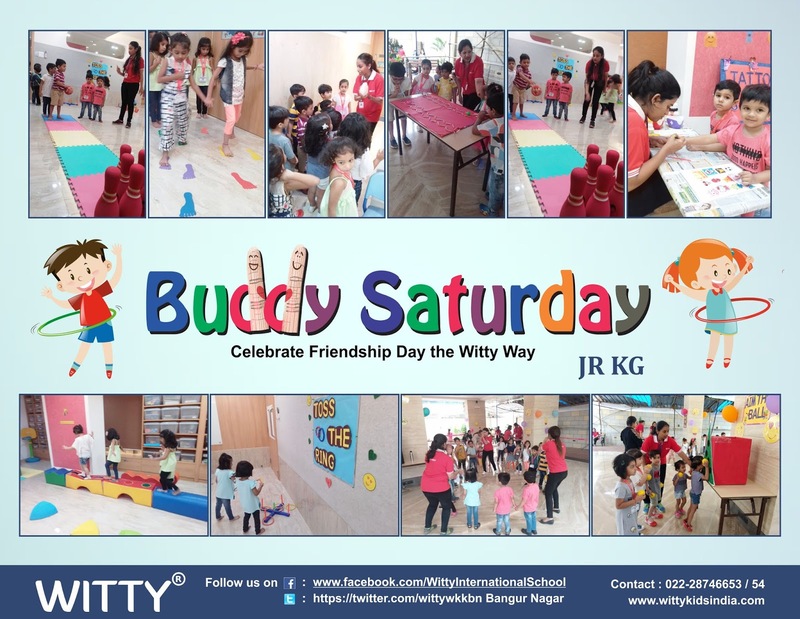 Our Jr Kg and Sr Kg Wittians celebrated Buddy Saturday on August 3rd 2018, wherein every child had to bring a non wittian as a buddy for the event. The event aimed at emphasising the importance of friends. This unique event had games and activities aimed at strengthening bonds of friendship through shared experiences.Activities like BLOW THE STRAW, AIM THE BALL, and MUSIC AND MOVEMENT ,TATTOO STUDIO to build confidence, coordination and social interaction amongst the buddies. The Soft gym had a plethora of fun games and activities like, BUDDY HOPSCOTCH, BUDDY TOSS THE RING, BUDDY BOWLING and BUDDY PRINTS…..all of which had the children clapping and screaming in excitement. The children also went around the school hunting the Witty with witty hints provided by the teacher. BUDDY SATURDAY would have definitely been incomplete without the screening of an animated movie "The Cocoon", which both buddies enjoyed in the mini theatre at Witty World with some popcorn. As the event drew to a close, Little Wittians and their Buddies left Witty World proudly getting themselves clicked on the Buddy bench and carrying the memory of a life-time in their hearts!! !